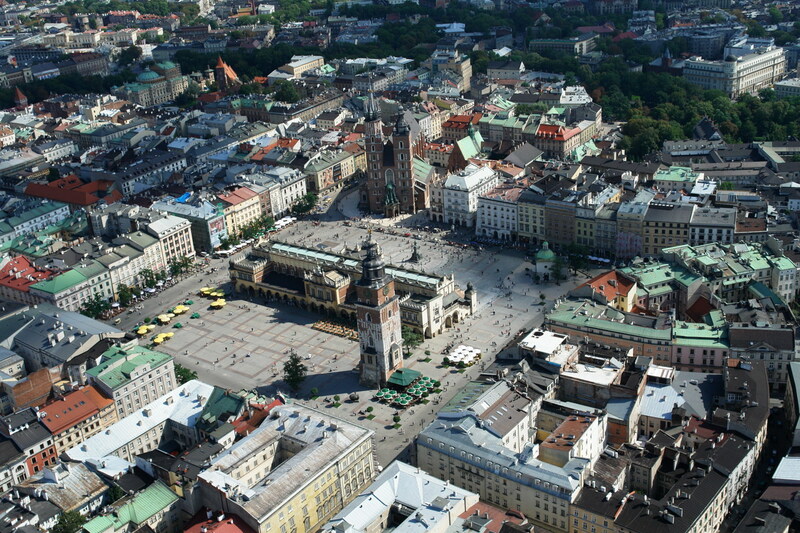 The huge main square was staked out for the city when Kraków received its city charter based on Magdeburg Law in 1257. It was set up at the intersection of ancient trading routes, on the plan of a square, with each side slightly exceeding 200 m (650 ft). 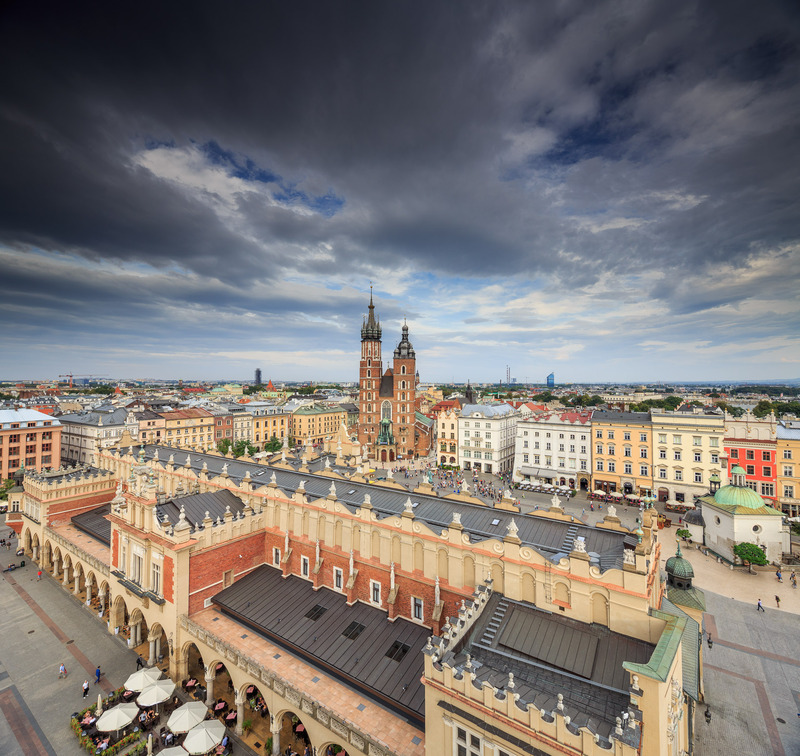 The name Rynek (Market Square), deriving from the German word Ring, was first used around 1300, and the current one – Rynek Główny (Main Market Square)– has only been in use since the end of the 19th century. 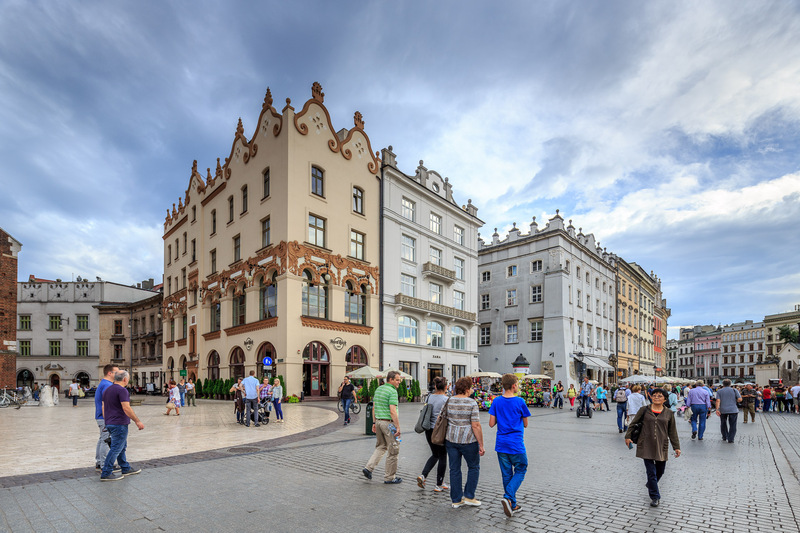 The urban design followed the distinctive cross grid layout, characteristic of mediaeval cities, with the Market Square becoming its central point. 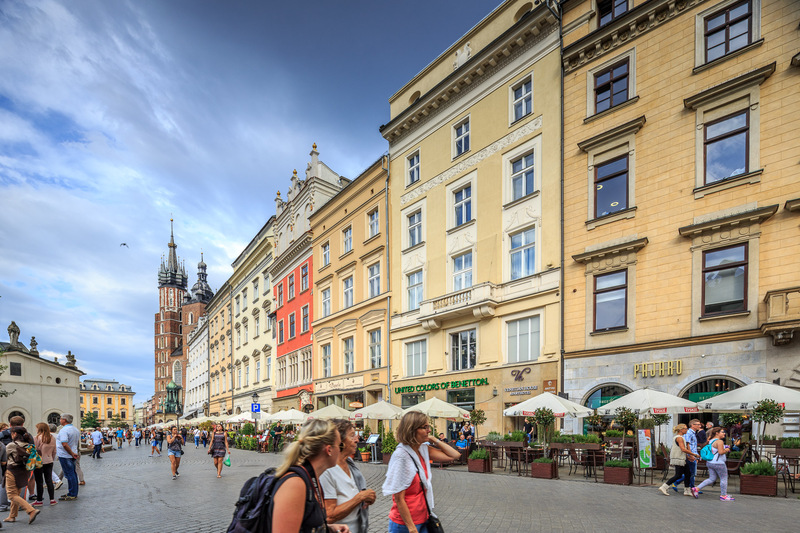 There are three streets leaving each side of the market, with only Grodzka, running along an ancient trading route and in the close vicinity of St Adalbert’s Church, receiving a different form: that of a broadway running at an angle. Some other concessions and derogations also had to be made, as there had been earlier structures standing in the area even before the charter; they obviously included St Mary’s and St Adalbert’s church. 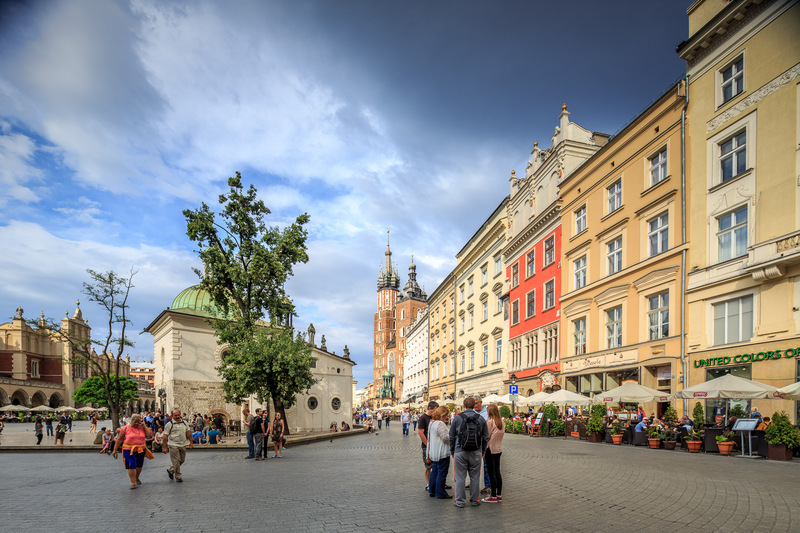 With its regular urban design retained since the Middle Ages and the central Main Market Square, Kraków’s city centre was inscribed on the original UNESCO list in 1978, which made it one of the world’s first twelve UNESCO-listed sites. Even with all the irregularities accounted for, the plan accompanying the city charter radiated simplicity and functionality. This modern centre was designed to satisfy all the basic needs of the population connected to the functioning of the city (the town hall being the seat of the authorities), trade and economic life (the Cloth Hall), and finally the spiritual dimension (with St Mary’s being the parish church). It was also the place where executions and punishments were carried out: the rostrum for the executioner was put up between St Mary’s and the Grey House (Szara Kamienica, currently at No. 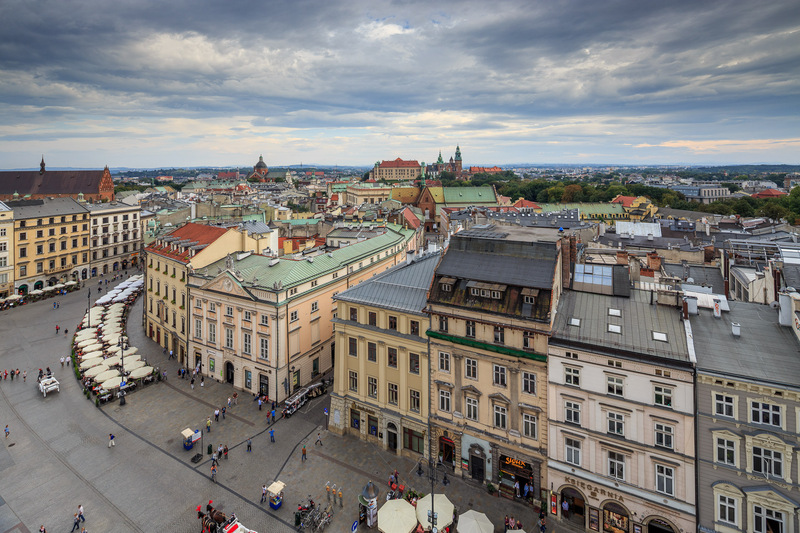 6), and the whipping post where criminals could not only be publicly lashed, but also branded, stood at the mouth of Sławkowska Street. 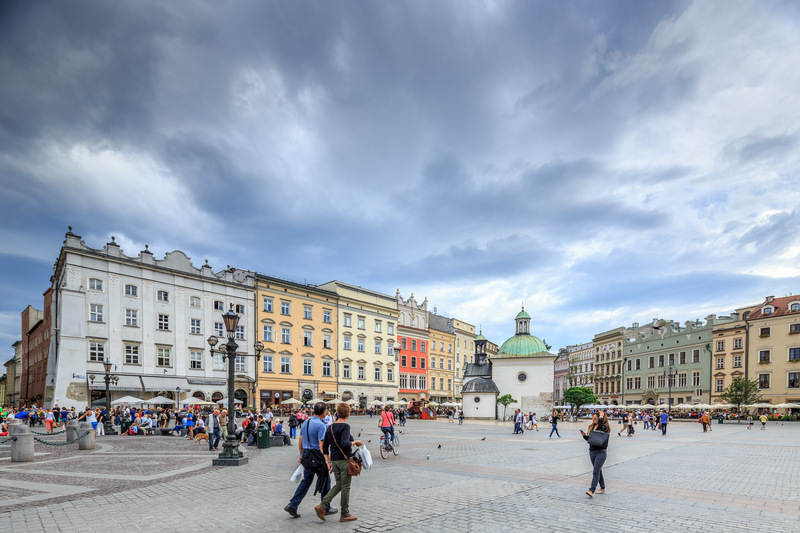 Although it might have seemed that the 13th-century design of the square was too big, as it made the Main Market Square the largest square in medieval Europe (today, it remains one of the largest), the Main Market Square developed quickly, mostly with stalls, where the owners traded cloth, salt, barrels, shoes, as well as coal, lead, and copper. 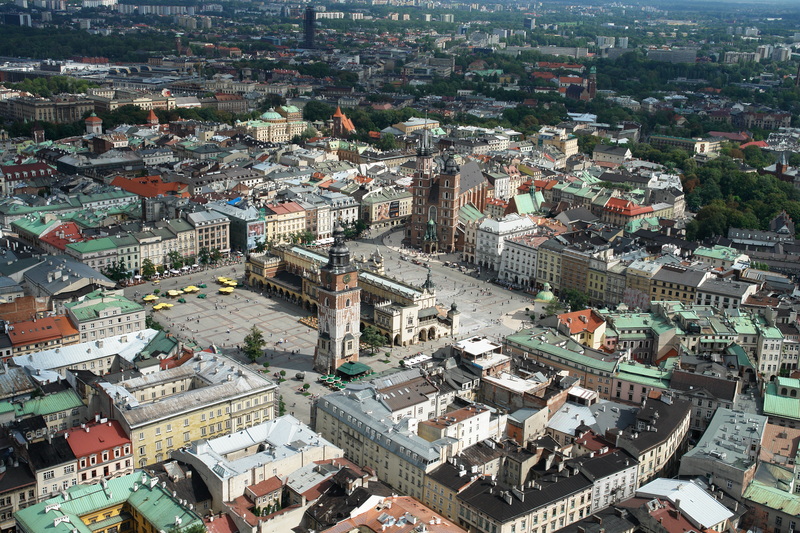 The structures were as makeshift as they were chaotic and were hardly a source of pride for the Main Market Square. 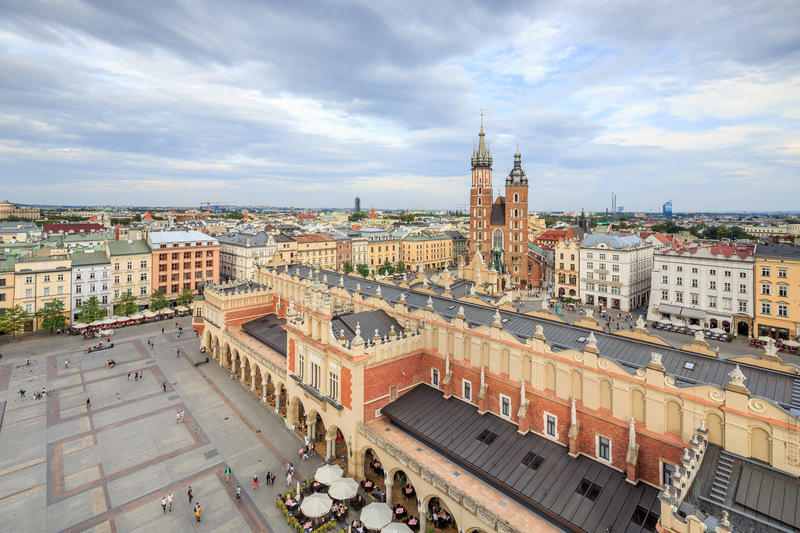 When the local authorities embarked on a campaign of ordering the city space of Kraków in the 19th century, the stalls, lean-ons and annexes around the Cloth Hall were razed, and there was a simultaneous refurbishment of the central building. Also knocked down were the buildings of the Large and Small Scales standing between the Town Hall Tower and the Church of St Adalbert. By the way, the Town Hall had been taken apart somewhat earlier, with only the tower remaining. 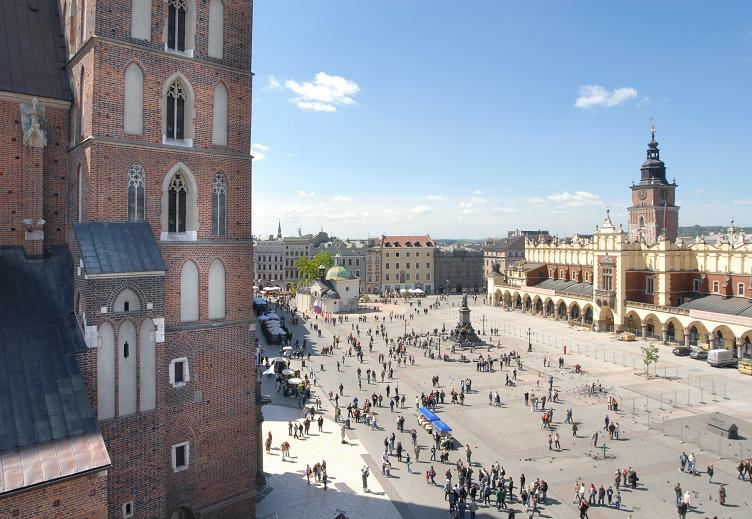 In 1898 the Monument to Adam Mickiewicz was unveiled. 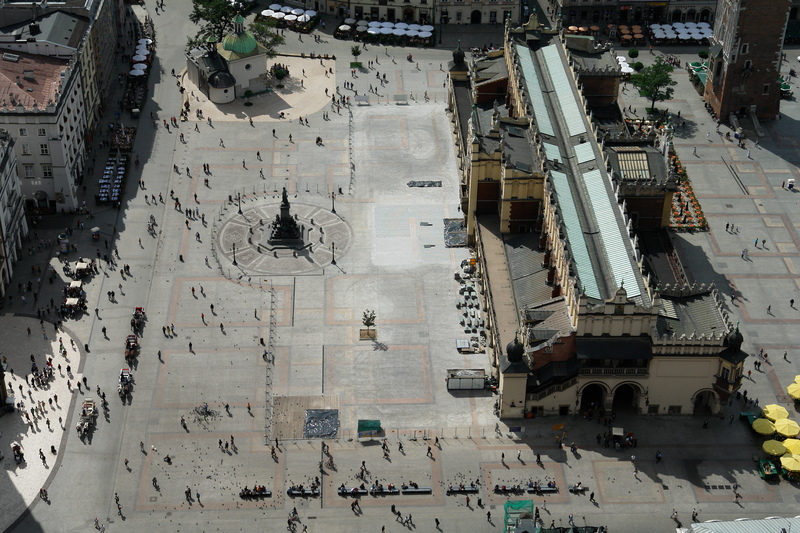 This is how the look of the Main Market Square became similar to that which we know today. 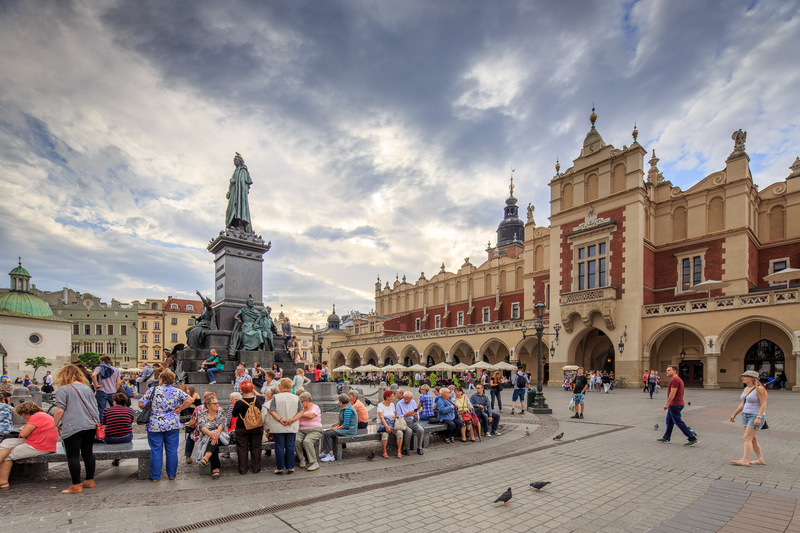 References to the commercial traditions of the Main Market Square include the fairs organised here before Christmas and Easter, while the stalls of Kraków florists add an indispensable dash of local colour. 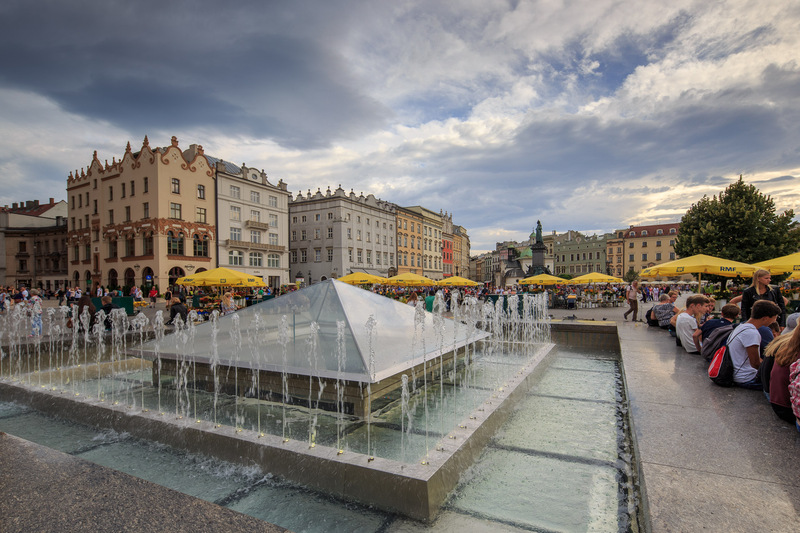 From its earliest days, the Main Market Square was the centre of social and political life, the backdrop for solemn processions of monarchs and homages paid to kings, the place of triumphs, parades, and lavish weddings. 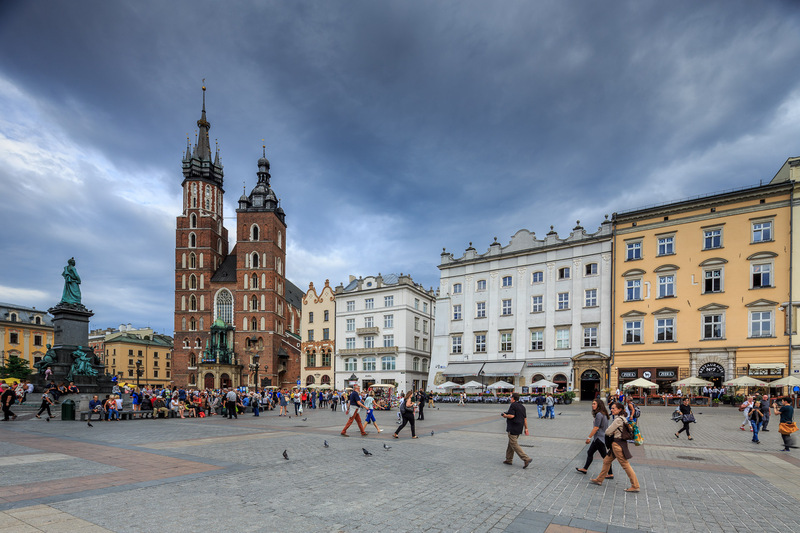 The Main Market Square was situated on the so-called Royal Route leading from the Barbican to Wawel: a path for the official entries of the king and foreign envoys. 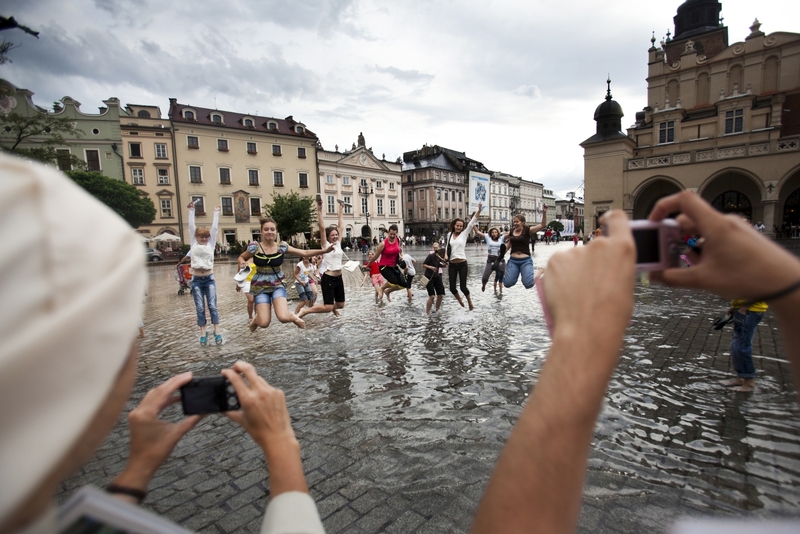 Frequently, the significance of the events taking place within its confines would go far beyond the borders of the city. In 1525 Albrecht Hohenzollern, Prince of Prussia, swore allegiance to King Sigismund the Old (Zygmunt Stary), which marked the end of the 300-year-long period of disputes and wars with the Teutonic Order. 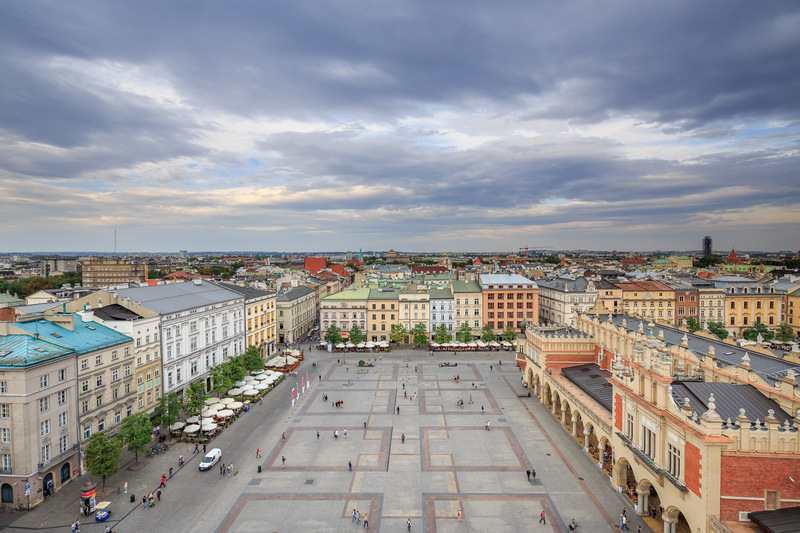 It was also here that Tadeusz Kościuszko pledged to the nation in 1794, formally beginning what became known as the Kościuszko Rising. 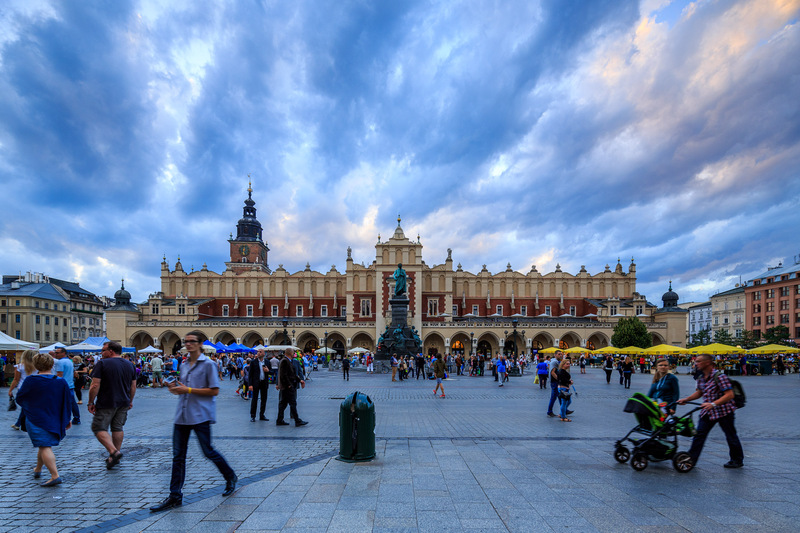 It was in the shadow of the Town Hall Tower that the Polish soldiers disarmed Austro-Hungarian army in 1918, thus making the Market Square the first expanse of restituted Poland after 123 years of partitions. In much more recent times, in May 1981, a particular silent demonstration took place here: the White March being a spontaneous protest after an attempt on the life of Pope John Paul II. Events related to local traditions, some of which have been cultivated for decades (even centuries), lend the square a special colour. 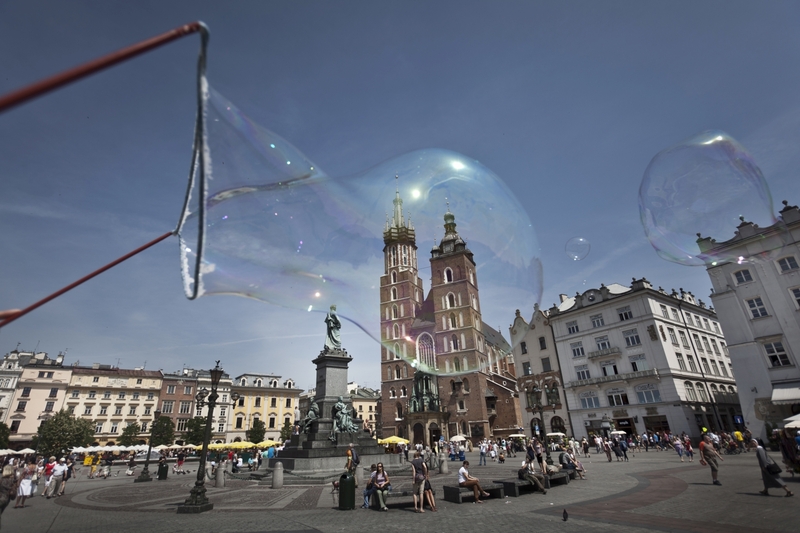 These include the procession of the Lajkonik – the Hobby Horse of Kraków, the pre-Christmas competition for the most beautiful nativity scene on the steps of the monument to Adam Mickiewicz (since 1937), and the Enthronement of the Fowler King. The square likewise cannot be imagined without the horse-drawn cabs and pigeons, the latter being knights that were transformed into birds, or so the story goes. Nonetheless, even if the pigeons turn out to be absolutely ordinary and not enchanted, the Main Market Square remains a magical place. Montelupich Mansion (Włoska, i.e. Italian, No. 7) – a 16-century member of the Montelupi family was the administrator of the first Polish regular post. 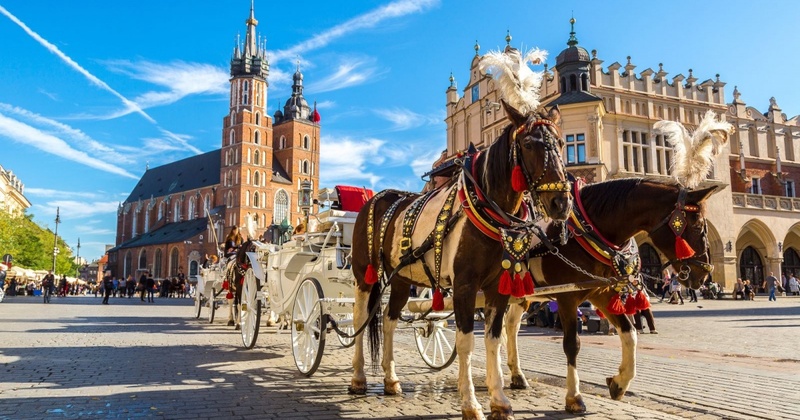 The horse-drawn coaches covering the route from Kraków to Venice departed from outside his mansion. It is entered through a mannerist portal bearing a Latin inscription Tecum habita (with you I live). Pod Jaszczury Mansion (Pod Jaszczurką, i.e. Under the Serpents or Under the Lizard, No. 8) – the name of the building (and the student club established many years later) comes from the mansion’s emblem set over the portal and portraying intertwined lizards. Bonerowska Mansion (No. 9) – in the 16th century, it belonged to one of the most powerful and wealthy burger families. The Boners administered the Royal Castle and were bankers. Transformed to their commission, the house obtained an early renaissance form. Enduring until our times are the high parapet by Santi Gucci with herms and gargoyles (mascarons), and the window frames of the first floor. Morsztynowska Mansion (No. 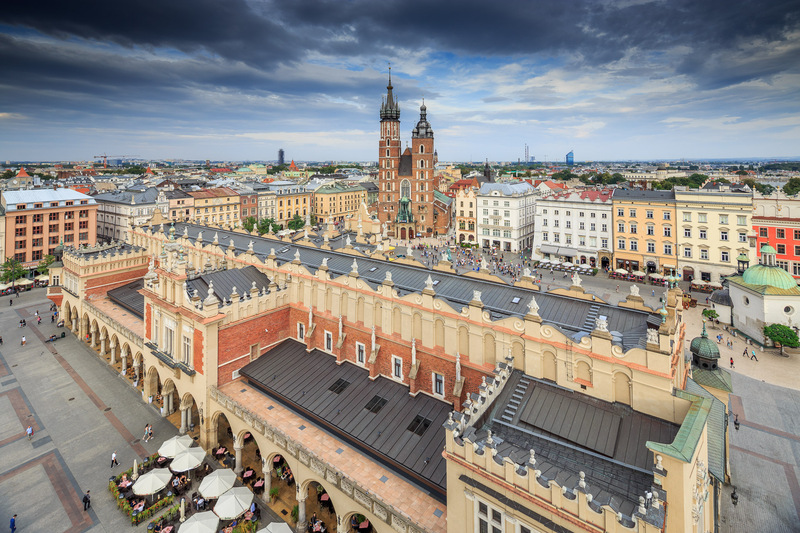 16) – tradition connects it to the person of City Councillor Mikołaj Wierzynek Junior, and the lavish banquet he threw in 1364. The feasting is rumoured to have lasted for 20 days, as the invitation from King Casimir the Great (Kazimierz Wielki) attracted Emperor Charles IV, Louis King of Hungary, Peter King of Cyprus, and a bevy of princes. A pretext to summon the Congress was the question of a crusade against the Turks. In fact, it was a diplomatic ploy helping to maintain the political balance in Central Europe. Moreover, the Congress was also designed as a manifestation of the power and riches of the Polish king: partially thanks to its grand setting (the guests received precious presents, including the gold and silverware on which they dined; some say that it brought financial ruin to Wierzynek) resounded strongly all over Europe. 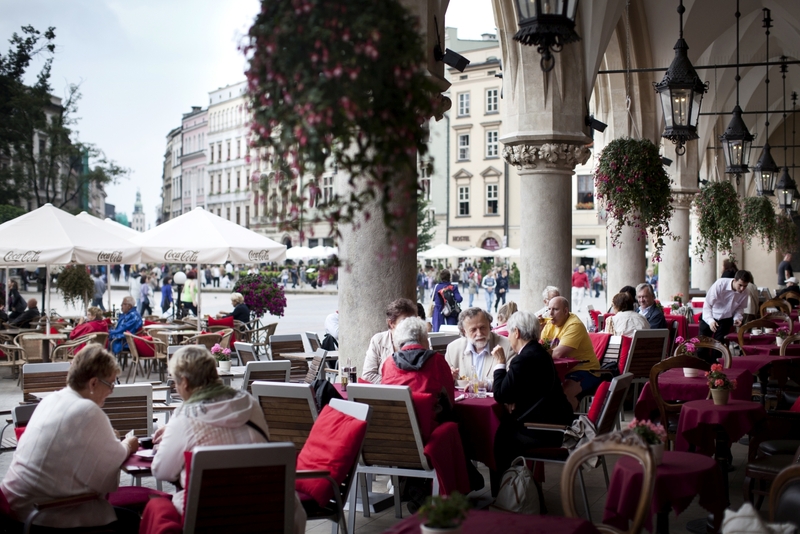 Although historians cannot agree whether it was the wealthy alderman that threw the banquet, the tradition is sustained by the restaurant operating here – it’s called Wierzynek. Pod Obrazem Mansion (Under the Blessed Virgin, No. 19) – the façade of the house is decorated by a painting of Our Lady that gave the name to the building. Although all the neighbouring developments burnt to cinders, this house was saved from the great fire of Kraków in 1850. The miracle was attributed to the mural. Pod Baranami Mansion (Under the Rams, No. 27) – takes its name from the heads of the rams that support the first-floor balcony. The arcaded courtyard is renaissance, and the halls of the first floor have retained elegant neoclassical decor in the style of Louis XVI. In the spring of 1956 the Piwnica pod Baranami (Vaults under Rams) Cabaret was inaugurated in the cellars of the mansion, and it operates to this day. Spiski Mansion (No. 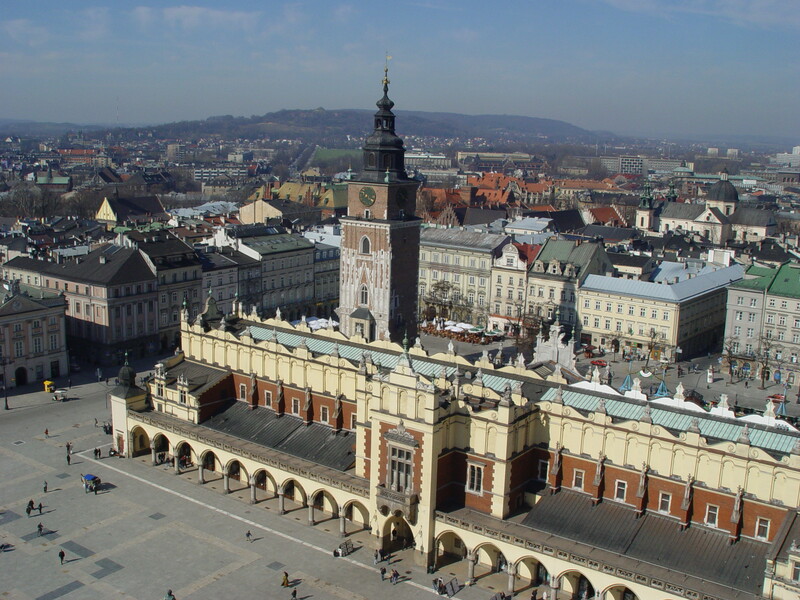 34) – the plays of the first municipal theatre of Kraków were staged late in the 18th century; later, the theatre moved to its seat to pl. Szczepański. Early in the 20th century, the famous Hawełka Restaurant opened here. Pod Krzysztofory Mansion (No. 35) – the building takes its name from the Gothic figure of St Christopher that used to be set in its façade. 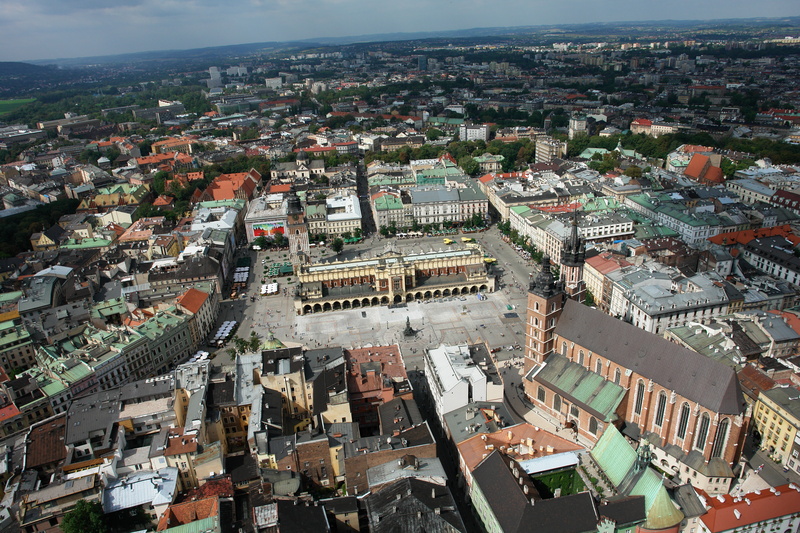 Today, it is part of the collection of the Historical Museum of the City of Kraków operating here. The treasures of arch-sorcerer Twardowski, guarded on his orders by a devil, became the source of a legend. Daredevils eager to come into their possession were plenty, yet only one local girl was lucky. She followed a cockerel that disappeared into the dungeons of the mansion, and waited till the bird transformed into a devil dressed in German garb. He let her take as much gold as she could carry, warning her, however, that she was not allowed to look back at any time, or she would lose everything. While standing on the last of the steps, the girl did indeed look back to make sure that the evil one was not chasing her. And then the heavy wooden door slammed shut with a bang, smashing the heel of the hapless girl. Not that high a price, as all the treasure remained in her apron. They say that the girl gave thanks for being rescued from the devil’s clutches by funding one of the chapels at St Mary’s. And the devil? He’s probably still waiting for daredevils in the dungeons of Pod Krzysztofory. There is also the Black Lady pacing the chambers of the mansion: she does not show herself often, yet she should be carefully avoided, as an encounter with her is an augury of imminent death. Pod Jeleniem Mansion (No. 36) – in the 18th century it housed an inn run by Marianna Lebonowa, whose visitors included Johann Wolfgang Goethe. Pod Orłem Mansion (No. 45) – with an aquiline emblem by Stanisław Wyspiański.